Patrick Michael "Pat" LaFontaine (born February 22, 1965) is an American former ice hockey center in the National Hockey League (NHL) who spent his entire career playing for the league's New York State-based teams. LaFontaine played for the New York Islanders from 1983 until 1991, the Buffalo Sabres from 1991 until 1997, and the New York Rangers from 1997 until his retirement in 1998, scoring 468 goals and 1,013 points along the way before his career was ended by concussions. His 1.17 points per game (1,013 points over 865 games) is the best among American-born ice hockey players, active or retired. In 2017 Lafontaine was named one of the '100 Greatest NHL Players' in history. LaFontaine served as an executive of the Buffalo Sabres as the President of Hockey Operations until March 2014. Although he was born in St. Louis, LaFontaine grew up in Waterford, Michigan. His father moved the family to the Detroit area in 1972. As a youth, LaFontaine played in the 1977 Quebec International Pee-Wee Hockey Tournament with a minor ice hockey team from Waterford. He graduated from Waterford Kettering High School. LaFontaine began his junior career with the Verdun Juniors of the Quebec Major Junior Hockey League (QMJHL) during the 1982–83 season). In his only season in the QMJHL, LaFontaine contributed 104 goals and 130 assists for Verdun. LaFontaine's 234 points was tops in the league and he was awarded the Jean Béliveau Trophy as the top scorer, out-dueling future NHL icon Mario Lemieux. His rookie season broke many records, including Guy Lafleur's 40-game point-scoring streak and Mike Bossy's 70 goals by a rookie. Other awards LaFontaine received that season were the Michel Brière Memorial Trophy as the MVP of the regular season, the Guy Lafleur Trophy as the MVP of the playoffs, the Michel Bergeron Trophy as the Offensive Rookie of the Year, the Mike Bossy Trophy as the best professional prospect, and the Frank J. Selke Memorial Trophy as the Most sportsmanlike player. Also in 1982–1983, Pat Lafontaine was chosen as the CHL Player of the Year. On October 1, 1981, the New York Islanders traded Bob Lorimer and Dave Cameron to the Colorado Rockies for the Rockies' (later market rival New Jersey Devils') first round draft pick in 1983; LaFontaine was selected by the Islanders in the first round as the third pick overall in the 1983 NHL Entry Draft with that pick. After representing the United States in the 1984 Winter Olympics in Sarajevo, Yugoslavia, LaFontaine joined the Islanders in time for the Stanley Cup Finals. His arrival was concurrent with the beginning of the end of the Islanders' dynasty, as the team was steeped deep in aging veterans. The Islanders lost the finals that year to the Edmonton Oilers, ending the team's run of consecutive Stanley Cup championships at four. LaFontaine had a strong performance, scoring two third-period goals during the Islanders' 5–2 loss to the Oilers in the fifth and deciding game of the series. In the 1987 Stanley Cup playoffs, LaFontaine scored the winning goal in the fourth overtime period of the seventh and decisive game between the Islanders and Washington Capitals, known as the "Easter Epic". The game was started on Saturday, April 18, and concluded just before 2 a.m. on the 19th, Easter Sunday. "It was the most memorable moment in my hockey life," he later recalled. "Even today, wherever I go, people come up to me and start telling me where they were during the Easter Epic." The Islanders continued to struggle and in 1989, they missed the playoffs for the first time since 1974. In the first game of the Islanders' next playoff series, in 1990, LaFontaine suffered the first of many concussions, after a controversial, open-ice hit by James Patrick of the New York Rangers. He fell on his head and was unconscious while being taken off the ice on a stretcher. The ambulance he took was delayed en route to the hospital by Ranger fans who rocked and pounded it as it left Madison Square Garden. He was lost for the remainder of the series. The 1990–91 season was a successful season for LaFontaine, but not the Islanders, who finished with a record of 25–45–10. LaFontaine, frustrated with his situation on Long Island, turned down a four-year, $6 million contract offer and refused to report to the Islanders for the start of the 1991–92 NHL season. Three weeks into the season, on October 25, 1991, LaFontaine was traded, along with Randy Wood, to the Buffalo Sabres for four players, including former first overall pick Pierre Turgeon. In only 57 games in 1991–92, LaFontaine scored 46 goals and 93 points. The following season, LaFontaine recorded a personal-best and team-record 148 points (53 goals and 95 assists). The 148 points are also the most points scored by an American-born player in one season. His play-making ability helped his linemate Alexander Mogilny set a team season record with 76 goals (as of 2015, both LaFontaine's 95 assists, 148 points and Mogilny's 76 goals still stand as the Sabres' team records for a single season). LaFontaine finished as runner-up to Mario Lemieux in the scoring race and earned a spot on the postseason NHL All-Star Second Team. He was also a finalist for the Hart Memorial Trophy as NHL MVP and the Lady Byng Trophy as the most sportsmanlike player. In 1994–95 he was awarded the Bill Masterton Trophy as the player who best exemplified the qualities of perseverance, sportsmanship, and dedication to ice hockey. LaFontaine is one of five players in NHL history to skate for all three teams based in the state of New York. The others were Mike Donnelly, Jason Dawe, Martin Biron, and Taylor Pyatt. Unique amongst them, LaFontaine played his entire career in the state of New York while Donnelly, Pyatt, Biron and Dawe all played for additional teams outside the state in their careers. LaFontaine once joked about it, saying "I think I'm the only player in history who has been traded twice and hasn't had to change his license plate." The 1996–97 season was the beginning of the end of his career. In a game against the Pittsburgh Penguins, LaFontaine was hammered by François Leroux with a high hit to the head, knocking him out with a concussion, and resulted in post-concussion syndrome. He was determined to return, even though the doctors advised against such an attempt. Sabres management, in conjunction with team doctors and specialists, refused to clear LaFontaine to return, and recommended he retire. LaFontaine, still believing he could play, was traded to the New York Rangers in a cost-cutting measure for a second round draft choice in the 1998 NHL Entry Draft and future considerations on September 29, 1997. During his one season with the Rangers, he tied for the team lead in goals scored, and recorded his 1,000th career NHL point. In a game against the Ottawa Senators on March 16, 1998, LaFontaine accidentally collided with teammate Mike Keane and suffered another concussion. LaFontaine missed the remainder of the season and all of the next season, announcing his retirement formally on October 12, 1999. Since 2001, the Pat LaFontaine Trophy has been awarded to the winner of the Rangers-Islanders season series, with money paid by the losing team to the charity of LaFontaine's choice. He was inducted into the Hockey Hall of Fame on November 3, 2003. "I am truly thrilled to receive this tremendous honor," said LaFontaine upon receiving the news. "Growing up in St. Louis, I always played for the love of the game and never dreamed this could ever lead to my being a member of the Hockey Hall of Fame." He was inducted into the United States Hockey Hall of Fame in that same year. On March 3, 2006, the Buffalo Sabres retired LaFontaine's number 16. He was also inducted into the Buffalo Sabres Hall of Fame in 2004. LaFontaine was voted the 3rd greatest Buffalo Sabre in the team's 40-year history. In 1997, LaFontaine founded the Companions in Courage Foundation, an organization that builds interactive game rooms in children's hospitals throughout North America. In 2000, the Congressional Medal of Honor Society bestowed the Patriot Award on LaFontaine in recognition of his contribution to military morale throughout his career. In 2002, LaFontaine was given an honorary GOAL! Award, sponsored by the Points of Light Foundation, for having overcome depression and lived in the community through volunteer work. In March 2004, LaFontaine was inducted into the Michigan Sports Hall of Fame at a ceremony in Detroit. In March 2005, he was named recipient of the James Keller Award by The Christophers organization. Since 1987, the Award has recognized individuals who have contributed in a meaningful way to the well-being of young people. In 2007, LaFontaine was inducted into the Nassau County Sports Hall of Fame. As of 2011, LaFontaine has been part owner of the Soo Eagles of the NAHL, who drafted his son Daniel. On June 7, 2006, the Islanders announced that Pat LaFontaine would return to the Islanders as Senior Advisor to the Owner. This was short-lived, however, as LaFontaine resigned in protest only six weeks later on July 18, the same day that Neil Smith was fired by the Islanders. In March 2006, Pat LaFontaine's #16 was retired by the Buffalo Sabres and raised to the rafters of the First Niagara Center (formerly HSBC Arena), joining other Sabre legends Gilbert Perreault, Rick Martin, and Rene Robert (a.k.a. The French Connection), Tim Horton and Danny Gare. During the 2009-2010 NHL Stanley Cup Playoffs, LaFontaine appeared in an NHL cross-promotional commercial for Honda, featuring Neal Broten, Mike Richter, and himself constructing a pond hockey rink and playing a pick-up game with neighborhood children. As of 2010, LaFontaine works as a commentator for MSG Network Rangers broadcasts. On November 13, 2013, LaFontaine was announced to be the new President of Hockey Operations for the Buffalo Sabres. On March 1, 2014, Pat LaFontaine resigned his position as President of Hockey Operations with the club on Saturday after just over three months on the job to resume his previous role with the National Hockey League. ^ Lapointe, Joe (April 7, 1990). "HOCKEY; Bitterness Lingers Over Treatment of LaFontaine". The New York Times. Retrieved June 2, 2013. ^ a b Associated Press (October 25, 1991). "Isles trade LaFontain". The Hour. ^ Morreale, Mike G. (November 17, 2012). "In '92-93, LaFontaine's line was something special". nhl.com. Retrieved August 12, 2013. ^ Lapointe, Joe (September 30, 1997). "HOCKEY; Rangers Finally Make Deal for LaFontaine". The New York Times. Retrieved August 12, 2013. ^ a b Morreale, Mike G. (February 7, 2011). "Bruins shut Savard down for remainder of season". News. NHL.com. Retrieved March 21, 2011. ^ "Pat LaFontaine". All-Time Roster. Sabres Alumni Association. Retrieved March 21, 2011. ^ a b "All-Time Roster". 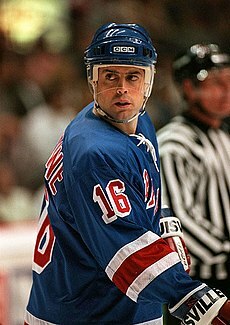 Pat LaFontaine. New York Rangers.com. Retrieved March 21, 2011. ^ Hahn, Alan (March 24, 2002). "LaFontaine Trophy Benefits Charities". Newsday. Retrieved March 21, 2011. ^ Westhead, Rick (November 4, 2003). "Hall of Fame Welcomes LaFontaine and Fuhr". New York Times. Retrieved March 21, 2011. ^ "Enshrinees". U.S. Hockey Hall of Fame. Archived from the original on September 4, 2012. Retrieved March 21, 2011. ^ "Buffalo Sabres Retired Numbers". Sabres Alumni. Archived from the original on April 9, 2011. Retrieved March 21, 2011. ^ "Buffalo Sabres Hall of Fame". Sabres Alumni. Archived from the original on June 18, 2012. Retrieved March 21, 2011. ^ "About the Companions in Courage Foundation". Companions in Courage. Retrieved March 21, 2011. ^ "Harvey receives excellence in journalism award from Medal of Honor Society". Journal Times. AP. September 25, 2000. Retrieved March 21, 2011. ^ a b "Pair of Numbers To Be Retired". Sabres.com. Retrieved March 21, 2011. ^ Redinger, Tim (June 21, 2012). "Pat Lafontaine Honored As Recipient Of Jefferson Award". sabrenoise.com. Retrieved August 12, 2013. ^ "The 56th Annual Christopher Award Winners". Christophers.org. Retrieved March 21, 2011. ^ "The Christopher Awards Backgrounder". Christophers.org. Retrieved March 21, 2011. ^ "Jordan Honored By Nassau County Sports Commission". cstv.com. March 21, 2007. Retrieved August 12, 2013. ^ DUHATSCHEK, ERIC (November 3, 2006). "Surprise! Islanders are suddenly respectable". Globe & Mail. Retrieved March 21, 2011. ^ "Pat LaFontaine Rangers TV Analyst". MSG. Retrieved March 21, 2011. ^ Harrison, Doug (November 13, 2013). "Pat LaFontaine, Ted Nolan return to Sabres". CBC Sports. Retrieved November 13, 2013. ^ "Pat LaFontaine new Sabres President of Hockey Ops". Twitter. Retrieved November 13, 2013. ^ Wawrow, John. "Pat LaFontaine leaves Sabres in turmoil in wake of his resignation". Associated Press. National Post. Retrieved May 18, 2014. Note: Ramsey resigned his captaincy during the 1992–93 NHL season, in favor of LaFontaine. Mogilny served as captain during most of the 1993–94 NHL season, while LaFontaine was injured and out of the line-up.